Despite rising food prices, Kyrgyzstan is able to feed itself and avoid a crisis, Arstanbek Nogoyev, Kyrgyz Minister of Agriculture, said in a recent interview with the Reporter-Bishkek newspaper. The Minister also believes high world food prices might stimulate further development of the agricultural sector. “Our hard-working people are able to feed the country, they just need substantial support from the government,” Nogoyev said. “I want to emphasise, one more time, that Kyrgyzstan's food security is under control. Speculation on the market does not necessarily translate into a crisis,” he added. An international food crisis resulted in speculation on the Kyrgyz food market, many experts say. However, local farmers have said they will cooperate with the government in the event all their production is needed only for the domestic market. In 2006, the UN Food and Agriculture Organisation listed Kyrgyzstan as among those countries well provided with food. The Kyrgyz Ministry of Agriculture hopes to receive the same listing in 2008. Nogoyev thinks one of the ways to revive agriculture, which used to be highly developed in Soviet times, is supporting food processing industries by exempting them from taxes and minimizing red-tape. “I've worked in processing industries and know that a well-functioning agricultural sector is impossible without processing plants. 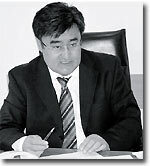 We have no right to only remain a supplier of raw goods,” Nogoyev noted. Minister of Agriculture Arstanbek Nogoyev speaking with the Reporter Bishkek Newspaper"
Another way of boosting agricultural production is to create voluntary farmers’ unions that will be merged into larger Agricultural Food Corporations. As selling land to individual farmers proved to be ineffective, Nogoyev now hopes that farmers’ unions will pursue larger goals and introduce better management. “Self-governing on two or three hectares cannot be a stable foundation for agriculture. This situation might only be fixed through voluntary unification of small farms,” Nogoyev said. He said he hopes such unions will also do a better job in agricultural planning and attracting investors.